I love samosas and was really thrilled to finally try an authentic samosa recipe at home. The vegetarian versions are my favorite and this is a nice version. Samosas are a fabulous East Indian appetizer recipe. A wonderful tasty dough is filled with spicy vegetetables and fried in ghee, Indian clarified butter. Don’t let the word butter scare you. Ghee is very healthy and Indians fry in it all the time. If you aren’t sure about the ghee, simply substitute a good quality vegetable oil like grapeseed oil. It won’t taste exactly the same though, so keep that in mind. This recipe isn’t too hot but it does include one green chili in the recipe. You can add more or less to your taste if you want, but samosas are traditionally not served too spicy. Steam the cauliflower and peas until they are both very tender. Put 3 tablespoons of ghee in a frying pan and add the chili, black mustard seeds and cumin seeds. When they begin to crackle, add the turmeric and hing. Add the steamed vegetables, and all of the remaining spices. Mash the vegetables a bit and cook the mixture over medium heat until you have a thick mixture for stuffing. This takes about 20 minutes. Let the samosa stuffing cool before stuffing the dough. For the dough, combine the flour with 1/2 cup of the ghee. Add enough water to make a rollable dough, approximately 1/2 cup. Roll the dough into 12 equal size balls. With a rolling pin, roll each ball into a 5 inch circle. Cut the circles in half. Seal the two straight ends together and put 1 tablespoon of stuffing into each triangle. Seal the edges tightly enough to hold together when frying. Heat the 1/3 cup of ghee in a wok until it is medium hot. Add the samosas and fry in the ghee for about 15 minutes, stirring and turning over occasionally until the dough is fully cooked and browned. Note: If the dough starts to burn you have the oil too hot. It should be about 350ºF. Makes 24 small samosas (5 inch circle) or 12 larger samosas. Serve hot or warm. 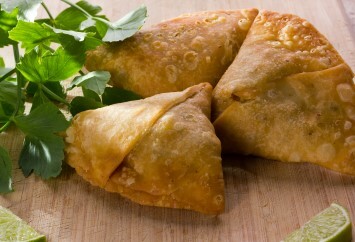 Samosas are traditionally served with tamarind sauce for dipping. Tamarind sauce is a somewhat sweet sauce that pairs perfectly with the savory vegetable turnovers. 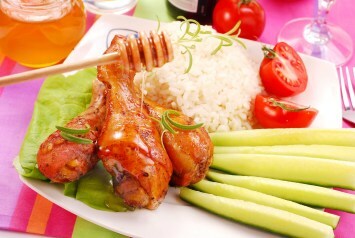 You can buy prepared tamarind sauce in most grocery stores and for sure in any Asian specialty grocery store. The cauliflower will take longer than the peas, so start the cauliflower first and add the peas for the last few minutes. If you have fresh peas they will take longer to cook, but the frozen ones only take a few minutes. You can replace the cauliflower with an equal amount of steamed potatoes, cut into very small pieces. 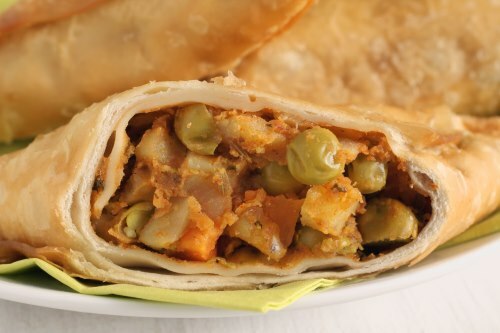 The mixture of potatoes and peas is actually the more common samosa filling and is what is used in the samosas pictured below. Either way, they are fabulous. Just use the vegetable you prefer. That’s what I love about cooking. As long as you keep the majority of the ingredients the same, you can make all sorts of changes to a recipe that better suit your tastebuds or what you might have on hand. You can replace the ghee with a good quality vegetable oil in this recipe. I would use grape seed oil as I said above, because it heats up well and has a nice light taste. That said, if you can find the ghee, it is the right ingredient to use and does give the samosas a distinctive flavor that is quite delicious. You can add other vegetables to the samosas too if you like. I have seen small amounts of corn kernels, chopped carrots and onion used. They should all be at least par cooked before you use them to make sure they aren’t still hard after the samosas are fried. If you want larger samosas, simply cut a larger circle to start with. Follow the same directions, but add more filling to the larger pockets. Hing is a commonly used name for the eastern spice Asafoetida. Asafoetida has a strong, pungent odor, but used in small amounts it adds wonderful flavor to Indian recipes. Hing can be found in specialty Indian and Asian grocery stores, but there really is no substitute, so if you can’t find it, just leave it out. The recipe only uses 1/4 teaspoon of hing for 24 samosas, so it isn’t an essential ingredient. See our other recipe for samosas here. That one uses filo pastry instead of making your own dough. You will find all of our Indian recipes listed here.